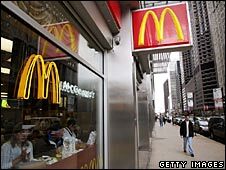 McDonald's says its net profits jumped 23% in the last three months of 2009. Fourth-quarter profits at the firm were $1.22bn (£756.79m), up from $985m for the same period a year earlier. The UK was McDonald's best-performing major market last year, with consumers drawn to its value meals, the company said in its statement. Globally, full-year revenue fell 3% to £22.75bn. The firm served 60 million customers a day in 2009, up from 58 million a day in the previous year. In a statement, Steve Easterbrook, chief executive of McDonald's UK, said value was important to customers "now more than ever". In the UK, the firm has seen particular increased demand for its budget menus. "If you have just got a pound in your pocket, you know there is always something for you in McDonald's," Mr Easterbrook said.